How to predict waiting time using Queuing Theory ? Home Business Analytics How to predict waiting time using Queuing Theory ? Queuing Theory, as the name suggests, is a study of long waiting lines done to predict queue lengths and waiting time. It’s a popular theory used largely in the field of operational, retail analytics. In my previous articles, I’ve already discussed the basic intuition behind this concept with beginner and intermediate level case studies. This is the last article of this series. Hence, make sure you’ve gone through the previous levels (beginner and intermediate). Arrival rate is simply a result of customer demand and companies don’t have control on these. 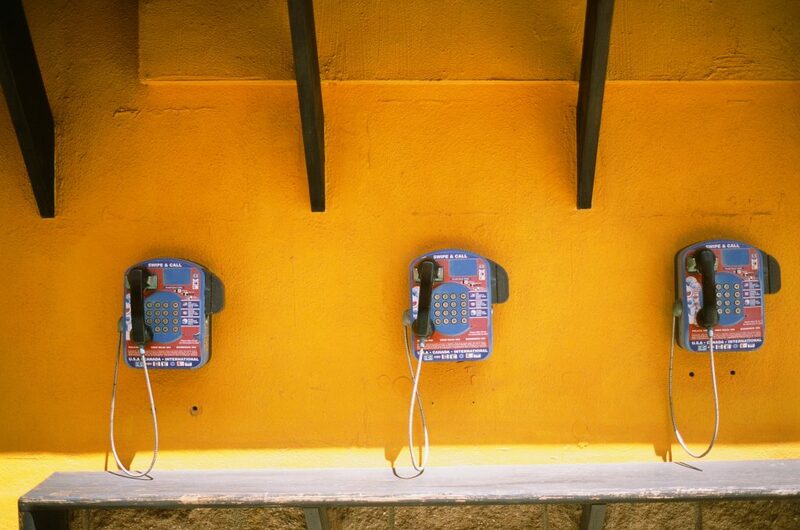 Service rate, on the other hand, largely depends on how many caller representative are available to service, what is their performance and how optimized is their schedule. In this article, I will bring you closer to actual operations analytics using Queuing theory. We will also address few questions which we answered in a simplistic manner in previous articles. What is Queuing Theory ? As discussed above, queuing theory is a study of long waiting lines done to estimate queue lengths and waiting time. It uses probabilistic methods to make predictions used in the field of operational research, computer science, telecommunications, traffic engineering etc. Queuing theory was first implemented in the beginning of 20th century to solve telephone calls congestion problems. Hence, it isn’t any newly discovered concept. Today, this concept is being heavily used by companies such as Vodafone, Airtel, Walmart, AT&T, Verizon and many more to prepare themselves for future traffic before hand. Let’s dig into this theory now. We’ll now understand an important concept of queuing theory known as Kendall’s notation & Little Theorem. 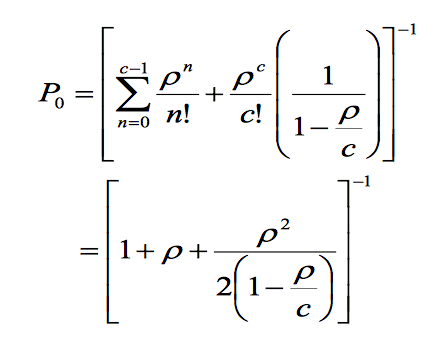 This notation can be easily applied to cover a large number of simple queuing scenarios. This is a shorthand notation of the type A/B/C/D/E/F where A, B, C, D, E,F describe the queue. Every letter has a meaning here. The various standard meanings associated with each of these letters are summarized below. C gives the Number of Servers in the queue. It has to be a positive integer. E gives the number of arrival components. In general, we take this to be infinity (∞) as our system accepts any customer who comes in. However, in case of machine maintenance where we have fixed number of machines which requires maintenance, this is also a fixed positive integer. The simplest member of queue model is M/M/1/∞/∞/FCFS. This means that we have a single server; the service rate distribution is exponential; arrival rate distribution is poisson process; with infinite queue length allowed and anyone allowed in the system; finally its a first come first served model. It’s an interesting theorem. Let’s understand it using an example. Consider a queue that has a process with mean arrival rate of λ actually entering the system. Let N be the mean number of jobs (customers) in the system (waiting and in service) and W be the mean time spent by a job in the system (waiting and in service). 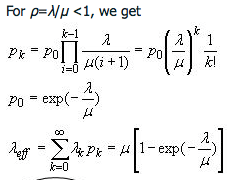 This theorem comes in very handy to derive the waiting time given the queue length of the system. This is one of the common distribution because the arrival rate goes down if the queue length increases. Imagine you went to Pizza hut for a pizza party in a food court. But the queue is too long. You would probably eat something else just because you expect high waiting time. As you can see the arrival rate decreases with increasing k.
With c servers the equations become a lot more complex. 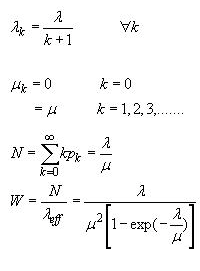 Here are the expressions for such Markov distribution in arrival and service. Imagine, you work for a multi national bank. You have the responsibility of setting up the entire call center process. You are expected to tie up with a call centre and tell them the number of servers you require. You are setting up this call centre for a specific feature queries of customers which has an influx of around 20 queries in an hour. Each query take approximately 15 minutes to be resolved. 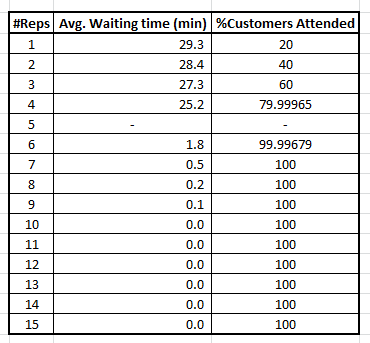 Find out the number of servers/representatives you need to bring down the average waiting time to less than 30 seconds. The given problem is a M/M/c type query with following parameters. 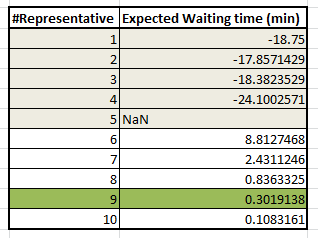 Here is an R code that can find out the waiting time for each value of number of servers/reps. A negative value of waiting time means the value of the parameters is not feasible and we have an unstable system. Clearly with 9 Reps, our average waiting time comes down to 0.3 minutes. Let’s take a more complex example. Imagine, you are the Operations officer of a Bank branch. Your branch can accommodate a maximum of 50 customers. How many tellers do you need if the number of customer coming in with a rate of 100 customer/hour and a teller resolves a query in 3 minutes ? You need to make sure that you are able to accommodate more than 99.999% customers. This means only less than 0.001 % customer should go back without entering the branch because the brach already had 50 customers. Also make sure that the wait time is less than 30 seconds. This is a “M/M/c/N = 50/∞” kind of queue system. Don’t worry about the queue length formulae for such complex system (directly use the one given in this code). Just focus on how we are able to find the probability of customer who leave without resolution in such finite queue length system. With this article, we have now come close to how to look at an operational analytics in real life. The application of queuing theory is not limited to just call centre or banks or food joint queues. It expands to optimizing assembly lines in manufacturing units or IT software development process etc. Did you like reading this article ? Do share your experience / suggestions in the comments section below. Great intro to queue theory. Earlier queuing system in railways is so rigid and decision to open additional counter is so slow, the result is passengers missing trains, ticket less travel rises, passengers have no alternatives to railway travel, hence looses time, effort, money and satisfaction. Today these parameters lead to on line book, making ticket servicing efficient and cost effective. So how this queuing theory is useful even beyond ‘queue’? I am trying to solve similar problem where I am trying to forecast incoming call volumes from customer using 2 years of data. 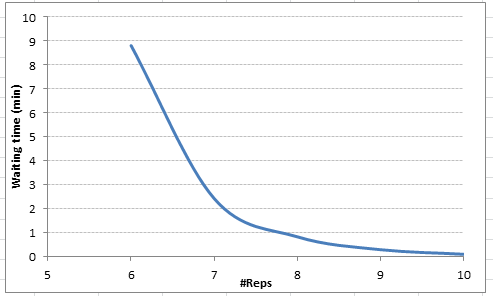 On the broader scope, this will actually result in optimizing number of reps needed on a given single day/month ? Can you please elaborate ? Thanks!